The symposium "Prehistoric Iberia: genetics, anthropology and linguistics" was held in the Circulo de Bellas Artes, Madrid on 16th -17th November 1998. 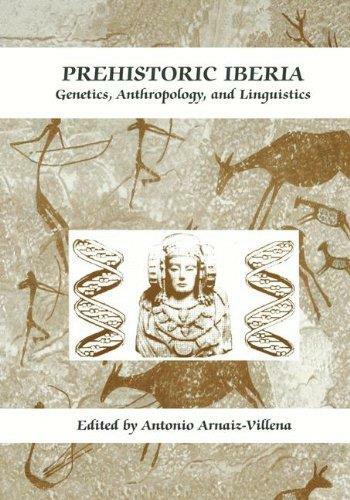 The idea was bringing together specialists who could address not clearly resolved historic and prehistoric issues regarding ancient Iberian and Mediterranean populations, following a multidisciplinary approach. This was necessary in the light of the new bulk of genetic, archeological and linguistic data obtained with the new DNA technology and the recent discoverings in the other fields. Genes may now be easily studied in populations, particularly HLA genes and markers of the mitochondrial DNA and the Y chromosome. Basques, Iberians, North Africans, Berbers (Imazighen) and Mediterraneans have presently been widely studied. The genetic emerging picture is that Mediterraneans are closely related from West (Basque, Iberians, Berbers) to East (Jews, Lebanese, Cretans); however, Greeks are outliers in all the analyses done by using HLA genes. Anthropologists and archeologists showed how there was no people substitution during the revolutionary Mesolithic-Neolithic transition; in addition, cultural relationships were found between Iberia and predinastic Egypt (EI Badari culture). Basque language translation into Spanish has been the key for relating most Mediterranean extinct languages. The Usko-Mediterranean languages were once spoken in a wide African and European area, which also included parts of Asia. This was the "old language" that was slowly substituted by Eurasian languages starting approximately after the Bronze Age (or 2,000 years BC).